On Friday, following a St Patrick’s Day on which I perhaps enjoyed a cider too many than was strictly wise (in my defence, they were WHISKY CASK. Whisky and cider – why, your man Patrick himself could scarcely have resisted), I was in serious need of some vegetarian comfort food. A big bowl of mash, which would have fitted the bill nicely, was too dull to justify, so, after happening upon a beautiful blog post on the subject whilst in search of granita advice at work, I decided on pasta carbonara. (This is my new favourite blog, by the way. It is all sorts of wonderful.) 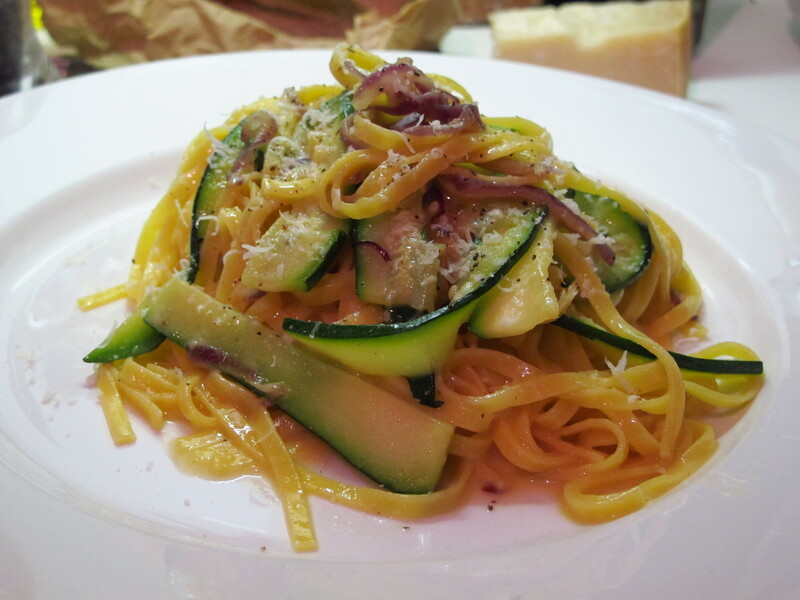 Clearly the guanciale (unsmoked pig jowl bacon, apparently) was off limits, but an old favourite, courgette, could step into the breach, and allow me to put her advice to the test – too often, my carbonara ends up rather like egg-fried pasta. 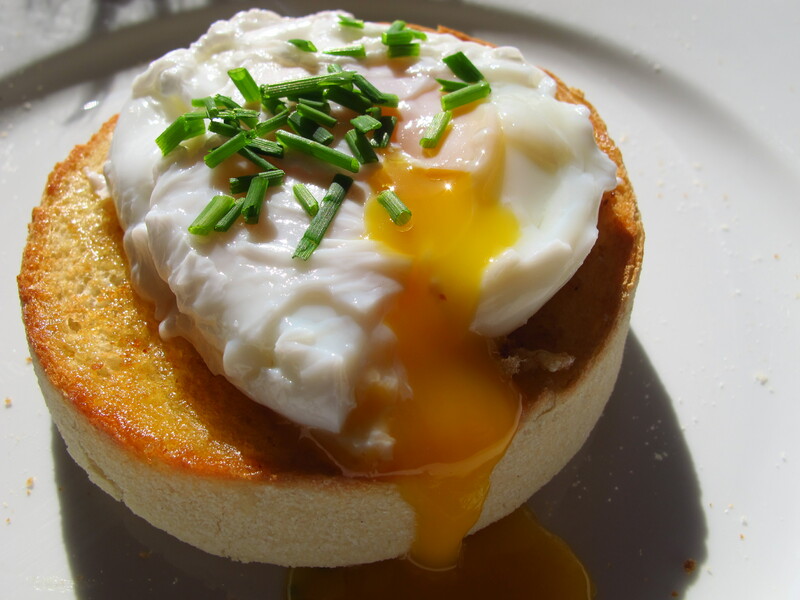 After running off a smidgen of the above the following morning, I devoured an immense English muffin I’d purchased at the South Bank cheese and wine festival while in search of a hangover-beating cheese toastie, with a lovely poached egg. It was pretty good, but a muffin of such proud proportions could have done with a hefty dollop of hollandaise to mop up. It felt a bit wasted on a single egg. Saturday night, I had an even bigger challenge; dinner at a local Sardinian restaurant. While all around me tucked into red mullet bottarga and spicy sausages, I had an aubergine and rocket pizza, spaghetti with pesto, or culurgiones, a dish I’d never heard of, to choose from. Obviously, I went for the last one; a sort of dumpling/ravioli cross stuffed with potato, mint and salty pecorino, and served with a tomato sauce. It was good – although not as good as the squid opposite looked. I was pretty excited about dinner this evening, with the fridge bursting with so much possibility. 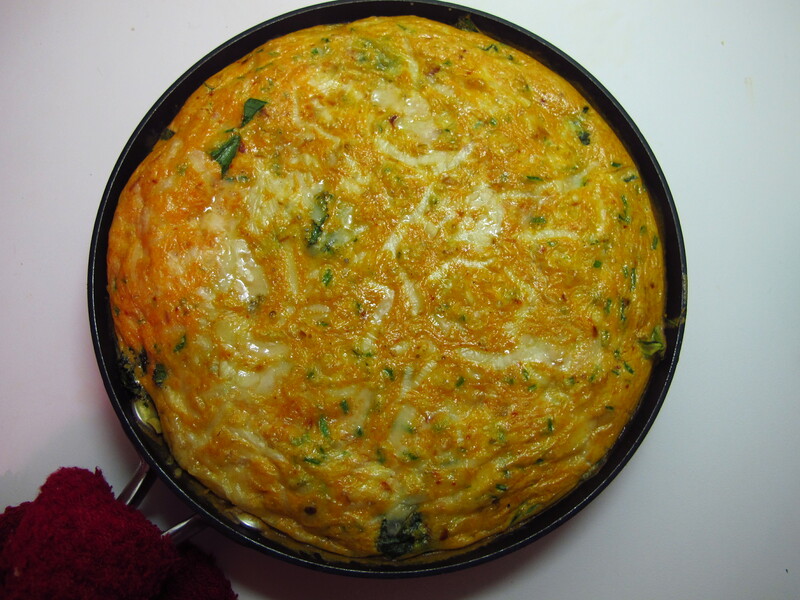 As I wanted to make something which I could wrap up for lunch during the week, I’d already decided on a wild garlic frittata but then, flicking through Ottolenghi’s Plenty, I happened upon his smoky version which, by fortuitous coincidence, contained a new ingredient I’d forgotten about – the scamorza affumicata I’d given into at the cheese market, after assuring Sharon I was just coming to keep her company. Although I’m a sucker for all things smoked, I’d always found myself vaguely disappointed by this mozarella-like cheese which seemed to be everywhere the summer we were in Italy – it lacked the saltiness to make it truly satisfying. 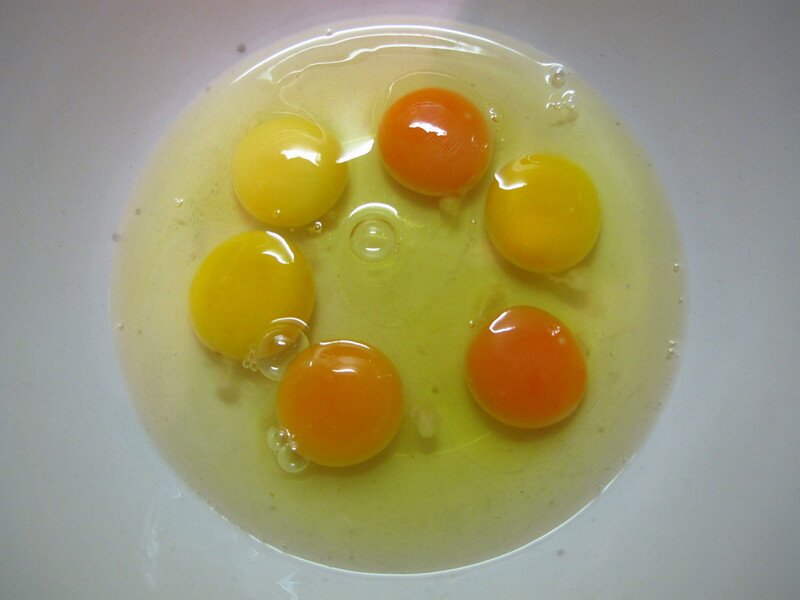 If I’d been serving it immediately, I would have left the centre a little runny, but the idea of taking liquid egg into work three days in a row was somewhat alarming, even to my cavalier health sensibilities, so I cooked it right through. In the end, however, I realised that, given the thing is about 98 per cent delicious stringy cheese, it probably would have made little difference. Although paprika-pink egg is vaguely unsettling, this is a real knock-out of a recipe – even my flatmate’s merry boyfriend, fresh from a slow-cooked shoulder of pork (aaaahhhh) down in Shoreditch, pronounced it a success, and he claims he’s pretty fussy when he’s drunk. I’m looking forward to lunch already. And no, I don’t know why I ate so many eggs this weekend. Possibly thanks to a lecture from my mum on the subject of protein, or more probably, just because I drank too much. 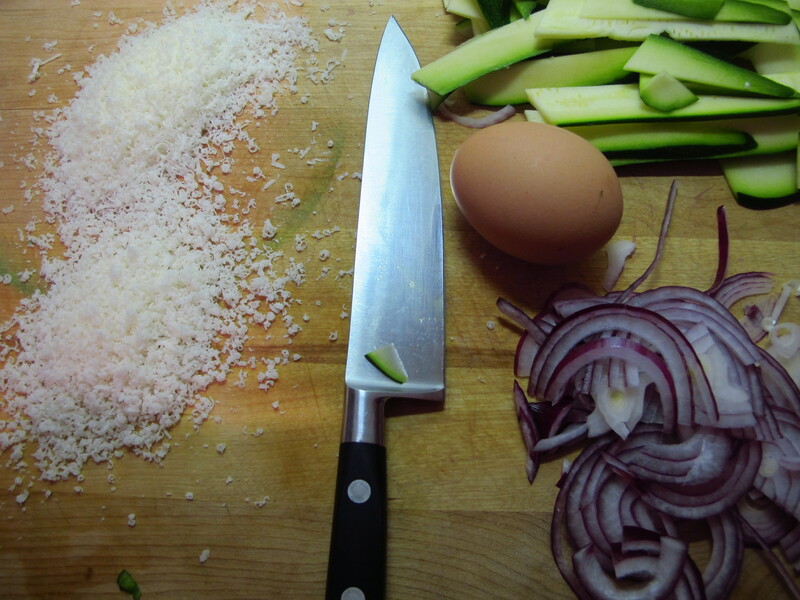 So grateful for the kind-of carbonara! Will definitely make that next time Mr Veg Box Man brings us courgettes. Good luck with vegetarian Lent. Guess you might be waiting a while for courgettes, but keeping seasonal and vegetarian would definitely have sent me mad after the first 25 carrot soups. Damn the hungry gap. 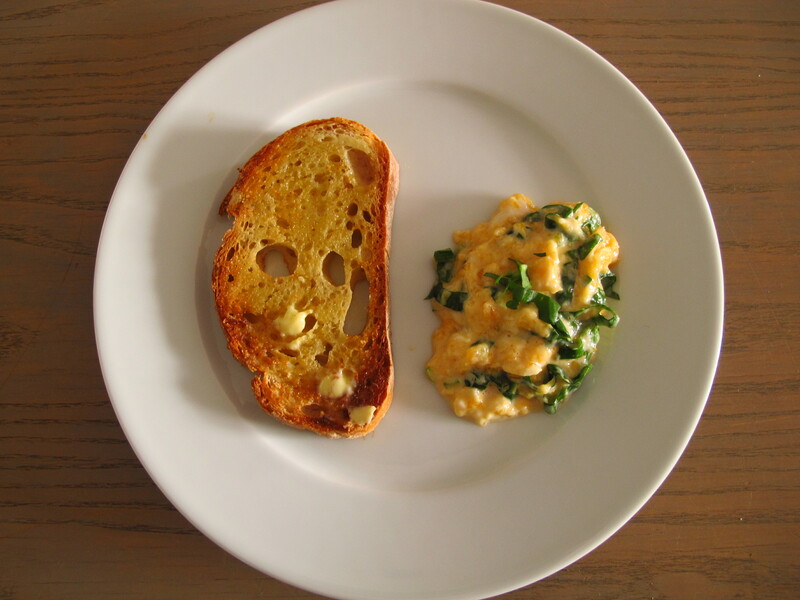 Not sure what to make first, the frittata with scamorza affumicata – waiting in fridge – or the scrambled egg and wild garlic on toast (I say three eggs a head). So happy about your carbonara appreciation.